Major media stocks led by Disney slid markedly on Thursday, continuing a month-long reassessment of the industry's valuation. You could call it an August Reset. A sell-off that started more than two weeks ago was refueled Thursday morning when a prominent analyst, Bernstein's Todd Juenger, downgraded Disney (DIS) and Time Warner (TWX). Disney stock ended the day down 6%, to $100.01, its lowest point in six months. Disney is a Dow 30 stock, and its decline weighed heavily on the overall average. Time Warner, the parent of CNN, closed down 5%, to $73,90, its lowest point in 2015. Other owners of television channels and programs also suffered. Viacom (VIA) closed down 6.2%. 21st Century Fox was down 4.2%. Comcast (CMCSA) was down 2.6%. CBS (CBS) Corporation and Discovery Communications (DISCA) were down 5.1%. Scripps (SNI) was down 5.0%. Netflix (NFLX), which continued its meteoric rise even as traditional TV stocks slipped earlier this month, also skidded on Thursday, down almost 8% at the end of the trading day. 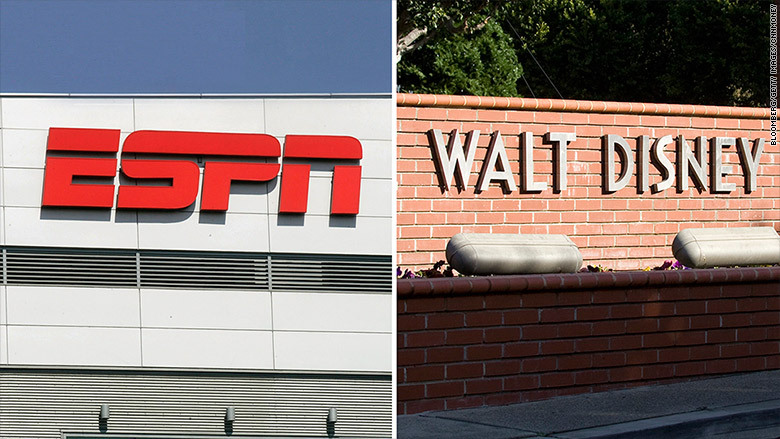 The reset started on August 4 after Disney reported second quarter earnings that were impressive in many respects, but included concerning news about its biggest profit engine, the sports network ESPN. Subscriber revenue from ESPN isn't growing as fast as it used to, partly because a small number of households have stopped paying for a monthly bundle of cable channels. The second quarter of the year tends to be the weakest for cable subscriptions. The vast majority of American households, about 95 million, continue to pay for some form of cable or satellite. But somewhere between 450,000 and 625,000 households cut the cord in the second quarter of this year, according to estimates from various research firms. This was, by all accounts, the industry's worst quarterly performance ever. SNL Kagan, which came up with the 625,000 household estimate, said the "period of general malaise" may be giving way to more significant declines. Disney's earnings were apparently a wake-up call. The next day's sell-off collectively erased billions of dollars in value. Analysts said concerns about cable cord-cutting were the driving force. The stocks hadn't made any dramatic moves since -- until Thursday's slide. Juenger said in an influential note to investors that a broad reevaluation of media stocks is warranted. "The market is now valuing U.S. ad-supported TV businesses as structurally impaired assets," Juenger wrote. "We believe this is fair and warranted, because: a) we believe TV advertising is undeniably in secular decline; and b) affiliate fees are now also being put at increased risk." Past valuations of the stocks is irrelevant now, he added, because "the world has changed too much." He downgraded Time Warner and Disney to "market-perform." Media executives generally remain mostly optimistic about the future of their powerhouse businesses, primarily because TV viewership remains at all-time highs. Executives like James and Lachlan Murdoch, who are now running Fox with their father Rupert, have predicted that small numbers of households will continue to cut the cord. James recently cited an "expected 1% annual industry decline in the number of base domestic subscribers." They believe this level of erosion is manageable, especially as the remaining homes gradually pay more for the monthly bundle. New ways of selling TV via the Internet, like Dish Network's Sling TV and a forthcoming service from Apple, also bolster industry predictions that the bundle will not fray too badly. But this month's stock reset is reflecting a sense that no one knows what consumers will do.